With the summer festival season fast approaching now is a good time to plan out some fresh outfits. But unlike styling for work or formal events, festival fashion is a balancing act between looking good and being practical. 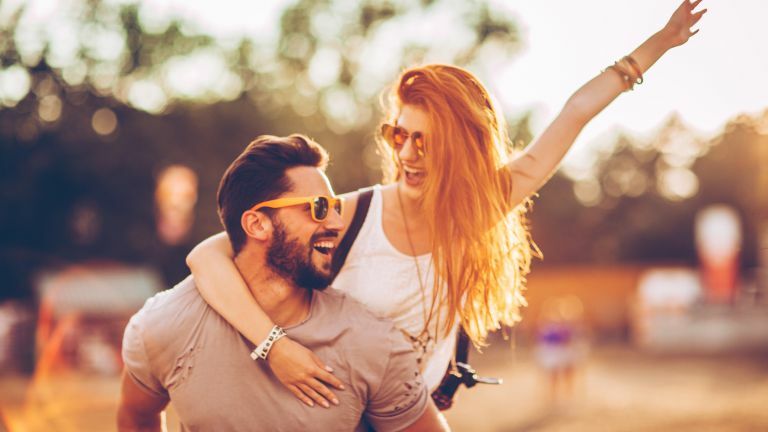 Whether you’re heading to a one-day festival or getting deep into long flights, week-long camping and all the rest, being ready for all weather conditions, many hours on your feet and regular splashes of beer and energy drinks is key. To help you work out a game plan, we’ve put together a guide to men's festival clothing so you’re ready for whatever the party throws at you. The humble T-shirt is going to be one of the centrepieces of your festival outfits. Whether a short festival or a week-long party, T-shirts are lightweight, comfortable and get the job done. Good options are a simple crew neck or sleeveless tee. If you want to amp it up, go for graphic or faded tees to add some visual barbs to your look. Try shopping around for a more original graphic tee though as there are plenty of cliche prints that can be on the boring side. Lastly, go for cotton and a looser fit for the ideal balance of comfort and style. If you’re after a sharper look, or need some complementary pieces for the tees you’ve thrown into your backpack, then a few bold shirts will work a treat. Solid options include printed shirts that complement other pieces in your outfit, along with long or short-sleeve shirts that can have the sleeves rolled up or be worn over tees. Why not go for a chambray or floral shirt? They’re easy to throw on and can give your festival ‘fit an easy style boost. Wearing a shirt over a tee also makes it easy to stay warm as the evening sets in, with the option to put the shirt into a bag should you be sweaty into the night. But more on bags a bit further down. You’re going to need some decent shorts for whichever festivals you’re planning to attend. Not only do they match well with shirts and sneakers, but they are also more comfortable for dancing and grass huddling than trousers. The are two strong options here. The first is denim cut-offs, which look great in faded blue, black or grey. You could also opt for sweat shorts to get the best of two worlds – the breathability of shorts with the comfort of tracksuit pants. For trousers, it’s hard to go wrong with classic skinny jeans or perhaps a looser cut if comfort is a priority for you. Ideally you’ll have multiple options to choose from, especially as your clothes get worn and messy. Part of your game plan should include checking the weather forecast shortly before festivals begin to see what you’re in for. If attending a festival in the UK, you definitely want to pack a light windbreaker. They fit into small bags and will help you deal with whatever rainfall comes your way, or cooling air as the sun sets. If heavy rain is expected then a durable rain jacket should be on your list. A zip hoodie also doubles as both a comfort and practicality item. An easy route here is to go for one in a solid neutral colour that can be easily matched to the rest of your outfit. If you’re looking to get more technical with layering then there are plenty of printed hoodies to suit your taste. Best of all – you could simply wrap a windbreaker over a hoodie should the weather go downhill. When buying festival footwear it’s good to remember that whatever you wear won’t be the same after the festival is over. Whether it’s dirt, rain or foot stomping that does it, festivals are pretty torturous for shoes. With that said, a pair of comfortable sneakers, canvas or boat shoes in darker colours should tick the boxes. White sneakers will look great, of course, but be prepared for some rapid wear to that box-fresh gloss. There are also boots for a stylish and more durable choice, so long as you’re okay with less overall comfort than the more pliable options mentioned above. Wellington gumboots aren’t for everyone but are extra practical when you know inclement weather is coming. On a final note, it’s best to avoid open-toe footwear, namely sandals and flip-flops, unless you don’t mind having your toes mashed on the d-floor. I’ll focus on just three types of festival accessory here – sunglasses, bags and hats. These will give you a variety of styling options but, just as important as style, these are all practical additions. With the potential for sunglasses to get lost, stolen or broken at festivals, you might prefer to leave your best pair at home. There are plenty of brands that sell affordable and stylish sunglasses, meaning you’re not going to be too frustrated should something happen. A drawstring bag is hard to beat when it comes to practicality and price. But if you need a bag that’s more durable that this, then a small, light backpack should be your preferred choice. It’s easy to decide which bag you need based on what you’re carrying – for example, if you have a DSLR camera, then a drawstring bag mightn’t have the structural rigidity you’re after. Now for hats. The right hat can have a drastic effect on your ‘fit, whether that’s due to a bold colour or eye-catching silhouette. A five-panel cap can give you a more boyish look, while a fedora can add a splash of dapper or show styling confidence. Lastly, while you could spend many hours deciding what to wear this festival season, it should ultimately come down to how you want to express your personal style and musical tastes. There’s plenty of inspo out there. The EDM and techno scenes have their own style and micro-trends in comparison to, say, the punk and indie scenes. Deciding where to aim when choosing new clothing for festivals might be an exercise in going against the norm. But ultimately, it’s all about having fun and expressing taste while seeing your favourite artists on stage. Happy partying!